Orange County Mayor Teresa Jacobs recently attended the Forward Progress to the 50 Beam Raising Ceremony at the Orlando Citrus Bowl to celebrate reaching the midway point of the stadium’s reconstruction. 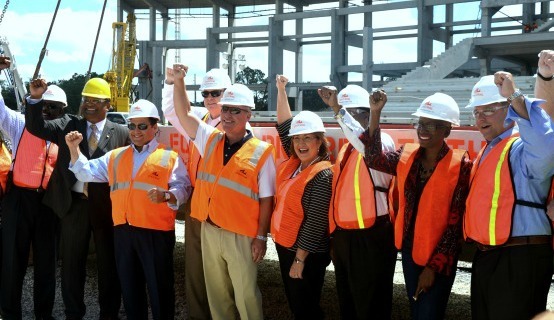 Mayor Jacobs, along with Orlando Mayor Buddy Dyer, District 1 Commissioner Scott Boyd, representatives from Florida Citrus Sports and site construction workers and staff, signed the concrete beam which was then raised and placed in the new lower bowl section at the 50-yard line of the stadium. “These major renovations at the Citrus Bowl will allow Orlando to remain competitive in attracting bowl games and other events,” Mayor Jacobs said. In January, Mayor Jacobs joined community leaders, business partners, and elected officials in the Florida Citrus Bowl Stadium reconstruction ceremony. Dignitaries and community and sports leaders shared stories of the Citrus Bowl throughout the years and spoke about how the reconstructed stadium will be a place for Central Florida’s families to create new memories. Constructed in 1936, the Citrus Bowl has hosted numerous outstanding athletic events including World Cup Soccer, Florida High School Athletic Association events and many high-profile college and bowl games. Over the years, the stadium has even been the venue of choice for star-studded performances by the Rolling Stones, Aerosmith and the Eagles. The reconstruction of the Orlando Citrus Bowl began in November 2013 and is halfway finished. It is projected to be game-ready by November 2014 and fully complete by April 2015. The renovated stadium will accommodate more than 65,000 guests and will feature a newly constructed lower bowl, a vibrant open-air façade, multiple LED digital video boards, expanded elevator and escalator service throughout and a 10,000-square-foot party deck. For event photos, please view the Flickr album.